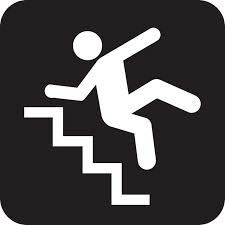 Although people of any age may fall, the elderly are at highest risk for serious injury. Studies have shown that 30 to 60 percent of people who live in the community fall each year. Landlords, property owners, business owners, and others are at risk for being the target of a premises liability claim when a person falls. Several years ago my husband fell in front of a restaurant because of a hazard that was just laying in wait for some unfortunate soul. The restaurant had a driveway that contained a curb that was impossible to see in the dark. My husband fell face first over it and fractured his eye socket. When I went to the restaurant to get him help, the owner came outside and observed my husband’s face dripping blood. “No one has ever fallen over that before”, he told me when I pointed out the hazard and advised him to put some kind of reflective paint on it to make it stand out. I gave him my card but he never called to find out how my husband was. Fortunately, my husband recovered without permanent injury. This restaurant is in my hometown. I waited to see how long it took before the curb was marked – 2 years! Some of these hazards relate to poor design, poor enforcement of safety codes, inadequate codes, and inattention. We all have a role in identifying hazards, pushing to get them fixed, and protecting our aging population from the risks of falls. Med League is a legal nurse consulting firm that assists attorneys handling cases involving medical negligence, personal injury and other litigation with medical issues at stake. We summarize medical records in fall cases to explain injuries and treatment. Call us for assistance. Would you like to get the update on Medical Topics? Sign-up for free eZines.